Although the impacts of Good and Service Tax (GST) on Indian economy are yet to come but its threat has already started exhibiting its effect on different segments. According to recent reports leading auto manufacturing companies like Maruti Suzuki India Limited, Hyundai Motors India Limited, Bajaj Auto have decided to share the loss that their dealers will bear on the inventories placed in their warehouses. It is reported that dealers are speculating the loss between 2.5% to 5% of the basic price over the inventory stocked in their yards on July 1, 2017 from which the GST law will be regulated. With the implementation of law the taxes which have been already paid by the auto manufacturers will not be refunded to the dealers as they do not come under GST regulations, but once they are sold by the dealers, they will be bound to pay sales tax to the government. It is believed that dealers of two wheelers will bear the loss between Rs. 1,000 and Rs. 3,000 and dealers of four wheelers will bear the loss between Rs. 8,000 and Rs. 40,000 on sale of each unit sold by them depending upon its variant. 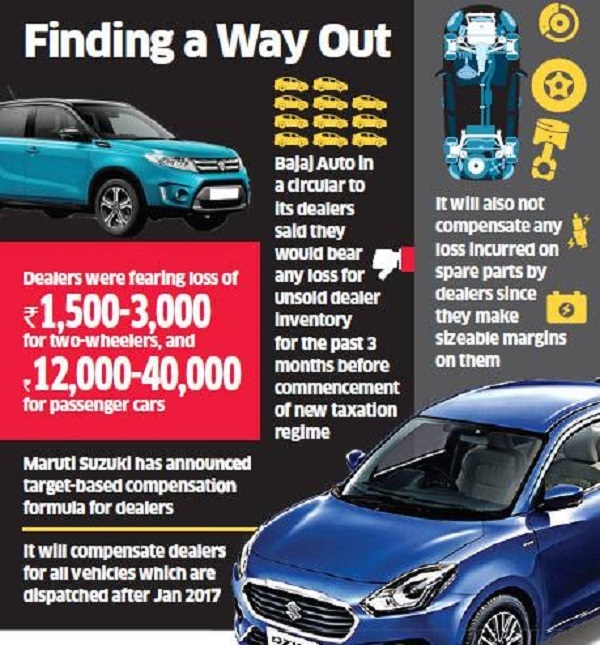 Country’s leading car maker Maruti Suzuki India Limited has decided the compensation formulae for its dealers that will be based on the number of units sold by them. According to this formula the Indo-Japanese car makers will compensate their dealers for all vehicles that were sent to them for sale after January 2017. This compensation formula will however not be applicable on vehicles like recently launched Dzire, Vitara Brezza and Baleno that are undergoing the long waiting period and about which it is believed that dealers will easily sell their stock depending upon their availability. On the other leading two wheeler manufacturer Bajaj Auto has sent a circular to the dealers, saying that the group will bear any loss for unsold dealer inventory for three months before the commencement of new taxation regime. The company’s support will be limited to unsold inventory at the dealers’ end and will not be compensated for any vehicle sold by a dealer to asub-dealer. Bajaj Auto will also not reimburse any loss incurred on spare parts by dealers since they make sizeable margins on them. Like both these groups, Mr. YK Koo, Managing Director, Hyundai India Motors Limited has written a letter to the dealers that the group will compensate them for any loss incurred due to non-credit of tax imposed on the during the invoicing and also shared the strategy that will be adopted for calculating the loss.